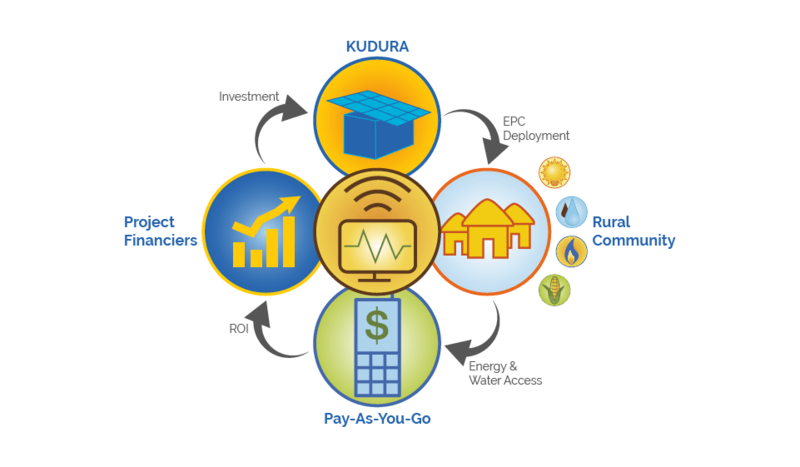 KUDURA is a technological solution that integrates multiple energy solutions with the goal of developing the rural world. KUDURA is an integrated clean energy and water solution that provides renewable electricity and biogas, potable water and organic fertiliser where there are none. 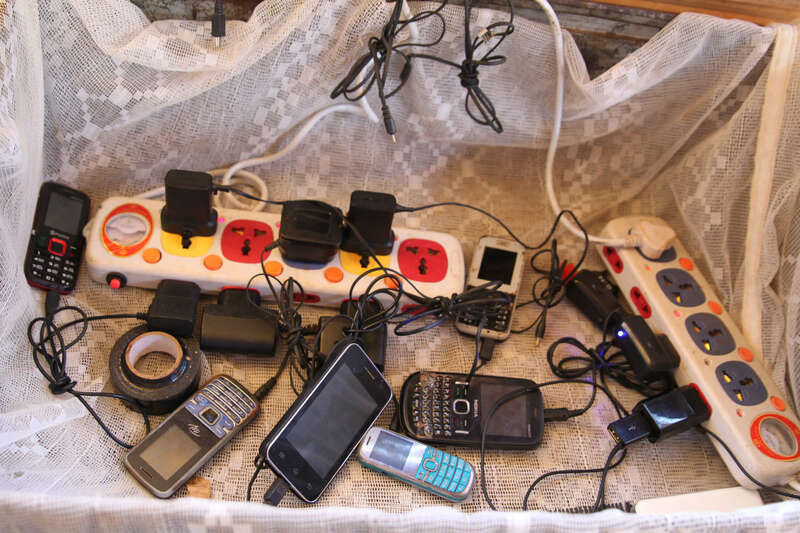 Electricity is typically provided via micro- or mini-grid while water and biogas are collected from the central location where the unit is installed. To reliably provide these cost-effective life-changing services, KUDURA utilises world leading technology in the form of a number of discrete but integrated sub-systems: a hybrid Solar Photovoltaic plant, a Biogas and organic fertiliser plant, a Water Purification plant and a Central Monitoring system for oversight of the system’s function and piece of mind. The system is a scaleable, self contained, integrated and completely stand-alone renewable energy solution. Typical installations require less than 24 hours until “switch-on”. The KUDURA minigrid energy hub is about securing futures for young boys and girls, about lifting families out of poverty, about strengthening communities, about shaping lives from dependency to providing ways for communities to create new opportunities. KUDURA is not about charity, aid, or a gift. It is about empowering communities with a sustainable, community-owned and run, clean energy and water solution. As a result communities control their own destiny and their practices protect the environment from harm. As a social entrepreneurship for profit, we apply sustainable technology to the benefit of the world’s poorest in a way that creates financial benefits for our investors, measurable life changing impetus for our customers and measurable positive impact on the environment in which we operate. We align ourselves with international initiative: the World Bank’s Lighting Africa initiative which aims to provide light to 250M people by 2030. We are applying sustainable business models and technology solutions to the benefit of the world’s poorest in a way that creates financial benefits or profit for our investors, life changing impetus and measurable social impact for the people who use our solutions and measurable positive environmental impact on the planet. This is also known as the “triple bottom line”. RVE.SOL is a triple bottom line [People, Planet, Profit] social entrepreneurship, not a charity, dedicated to solving this issue. Rural communities gain extra resources which lead them to create new jobs, increase the levels of education and richness. Investors RVE.SOL and KUDURA benefit from investment return when propagate renewable energy and poverty eradication. The use of local resources such as the sun and manure, eliminate dependence on resources such as kerosene and trees. Carbon reductions and soil erosion will be reduced. Too many people around the world continue to live in abject poverty through the inability to alter their status quo. These are the so-called base of the pyramid (BOP) demographic who subsist on less that $4 per day. The reality of their life is a forced reliance on hydrocarbon and biomass fuels, dirty ground water and over-use of agricultural land. This causes ongoing suffering and death from respiratory illness, water-born disease and ever decreasing income generation. Through the provision of fresh drinking water, electricity for lighting, biogas for cooking and fertiliser for crops, rural communities are transformed through increased access to communication, information and education, creating the opportunity to improve their own livelihood and thrive. A fully integrated, holistic solution built on robust and scalable technology, it is kick-starting micro-economies and creating impetus for rural villages to raise themselves out of poverty and fight the spread of disease. We believe that the introduction of these affordable energy and water services to poor rural communities is the much needed catalyst for initiating a process of poverty reduction that ultimately will mirror itself to wealth creation. We are creating that world by providing a solution that tackles these fundamental issues through simplicity, robustness and scalability. It will kick start economies in rural areas and as a result raise communities out of poverty and reduce the instances of disease. Clean, reliable and adequate lighting means school going boys and girls can study after sundown. It means reduced exposure to harmful kerosene fumes and less missed days at school due to respiratory and other such related illnesses. This in turn means better performance at school; their gateway to a more stable and successful future. Kerosene is also expensive! By providing access to electricity at affordable prices, we obviate the need to rely on kerosene – this saves money and increases productive time at night. Did you know that three jerry cans of water equate to the weight of a baby giraffe? Women and girls spend many hours per day collecting water and searching for firewood. Access to clean potable water by way of KUDURA means that they can direct this collection time instead to income generating activities. Girls are less likely to be pulled out of school to aid in these household chores, increasing their chances of receiving an education, escaping early marriage and securing not only their future but the future of their families. By employing local villagers to collect raw water for the community, KUDURA creates local jobs and allows the majority of the community to benefit from clean water obtained at a central location, saving time and money and increasing income. Access to biogas for cooking means that women and children can direct the many hours they spend in a day searching for firewood to other income generating activities. Once again, girls are able to focus their attention on school and bettering their eduction. By employing local people to collect cattle manure for digesting into biogas, we create local jobs and allow the majority of the community to benefit from clean cooking. This saves their lives and the environment in which they live. With a KUDURA rural hospitals and clinics don’t have to pay the extraordinary costs of a diesel generator just to provide basic services. Decreased deaths due to poverty and disease means a healthier more productive society which leads to job creation, growth and development of micro-enterprises. Poverty is reduced as communities mobilise their natural resources to start their own businesses and create their own wealth. Poverty, and its relation to illness and death is well documented today. Organisations like the International Energy Agency (IEA), the World Health Organisation (WHO), World Bank (WB), Lighting Africa (WB-LA) and of course by the United Nation’s (UN) Millennium Development Goals (MDG) initiative have published numerous papers and reports over the last 10 years that tie continued abject poverty to access to water, food and energy. In Kenya, Tanzania and Uganda alone, deforestation has amounted to more than 9.6M hectares over the last 10 years – 6.5, 19.4 and 26.4% of total forest cover respectively. A staggering 4 billion cases of diarrhoea are reported every year due to people drinking contaminated water – this results in preventable deaths of 2.2 million people every year. Water-borne disease accounts for over 5 million deaths a year – 40% of which are children under the age of five. KUDURA system is self-sustaining business model. KUDURA is a system block diagram with custom designed, for-purpose solution – envisioned by us to fulfill a very particular purpose and solve a number of very specific problems holistically; it incorporates technology components from the world’s leading manufacturers. Designed and built for maximum quality and reliability (ISO9000), it sets the standard for decentralised rural village energy and water solutions. The system is a scaleable, integrated and completely self-contained rural clean energy and water solution. Typical installations require less than 24 hours until “switch-on”. KUDURA is a containerised hub that provides potable water and clean energy for lighting, cooking and productive energy use where there is none. KUDURA relies on world leading technology in the form of a number of discrete but integrated sub-systems: a Hybrid biomass/solar Photovoltaic plant, a Biogas and organic fertiliser plant, a Water Purification plant and a Central Monitoring system for remote oversight of the hub. As inputs, raw water, agricultural waste, solar energy and animal manure are converted to potable water, electricity, biogas and organic fertiliser. These are stored at the installation site within the community and distributed to meet consumer demand on a “pre-pay-for-service” basis. Generation and distributing electricity from any source: Solar and Biomass. Creating clean, potable drinking water by means of UV filtration ot desalinization, opcional sanitation. Generating safe biogas for clean cooking from animal waste or food waste sources. 24hours and 7 days a week Real-Time central monitoring and control system monitors with intervention to guarantee “quality of service”. Flexible mobile prepayment and smart metering system provides easy payment options. KUDURA is a savings vehicle and wealth generator. We are outcomes-focused. By reducing the consumption of kerosene, diesel, charcoal and firewood we help people and businesses save money, build wealth and break the cycle of poverty while reducing environmental degradation.